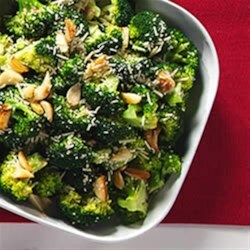 "Broccoli is roasted with garlic and olive oil, then tossed with lemon juice and shaved parmesan cheese." Wash the broccoli and cut it into bite-sized pieces. Place the broccoli on a large rimmed baking sheet. Mince the garlic and toss it in with the broccoli. Drizzle 3 tablespoons extra virgin olive oil over the broccoli, then season with coarse black pepper and kosher salt. Bake in the oven for 20-25 minutes until the broccoli is tender. Toss in lemon juice, parmesan cheese, and 1 tablespoon olive oil; serve immediately. I've also tried this recipe without lemon juice and added Panko bread crumbs, and I loved it even more. This a great recipe if you like all the ingredients. I added 10cloves of garlic with 2 heads of broccoli. I especially liked it cold,raw and marinating in the olive oil and garlic, salt. Good recipe. The broccoli got a little brown while baking but other than that turned out well. This is my new favorite way to make broccoli. It is delicious and easy, and not as fattening as au gratin. Love it!